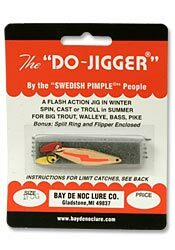 Flash More Fish with the “Do-Jigger®”! Our # 3 is great as a spin casting lure in summer for big trout, northern and bass, and the #1 as a casting or trolling lure for kokanee, jacks, smaller trout and bass. This polished metal spoon flashes in a lazy fluttering motion to whet the appetite of even well fed fish. Use 8 lb. Or 10 lb. Test line to hold the big ones! Use a cable leader only for big pike. Use this lure with an interrupted retrieve, (i.e. cast, let it settle, start up fast, slow down, stop, settle and repeat, pattern cast to cover the whole area). If the fish are rising to minnows, also try a straight in retrieve of various speeds from slow to fast until you find the type of retrieve that will produce strikes. For trolling, always use a swivel-trolling sinker about one foot or more ahead of the lure to eliminate line twist. Instructions for Ice Fishing/Still FishingFor still fishing and ice fishing, bait treble hook or use single hook with minnow, fish eyes, worms, grubs, etc. Use a chugging: or bobbing action, a sharp lifting action of about one foot. Drop rod tip and allow to settle. Wait a bit, shimmer lure by gently shaking rod tipsideways. Wait a bit; feel for a change before repeating action because fish may just be mouthing the bait and lure so you should delay until they have it firmly before setting the hook. Very jigging routine until you find the pattern that produces best for you. Extremely effective while ice fishing for walleye, northern, perch and trout. This is very effective in the dead of winter when colder water makes the fish too sluggish to chase a fast action lure. Use with bait! The flash attracts the fish; the bait provides the scent and taste. Our #1 is the best seller. Good for water depths to 20 feet. For deeper water areas use the #2 size. For the best, free-movement action, tie your line directly to the front split ring with an improved clinch knot, or use a round type snap swivel. Often a special large ring, single sproat type hook is better in winter with bait or when casting or trolling for kokanee or jacks. Sizes 2, 4, 6 and 8 are available. #1 DJ 1/6 oz – 1 ¾ in. #3 DJ 1/3 oz. – 2 ¼ in.